When its July and August in North Texas you can count on it being hotter than well…., you know, and in the landscape, you can rely on the Color Guard yucca for rugged perseverance and incredible beauty. In reality this plant is stunning 12 months in the year. If you are not familiar with Color Guard it is the best selection of the native Yucca filamentosa. Many of us have gone to California and come back lamenting that we can’t grow Phormium or New Zealand flax like they do and many also find the Cordyline to be temperamental. This will not be the case with this colorful plant sporting native DNA and cold hardy from zones 4-10. 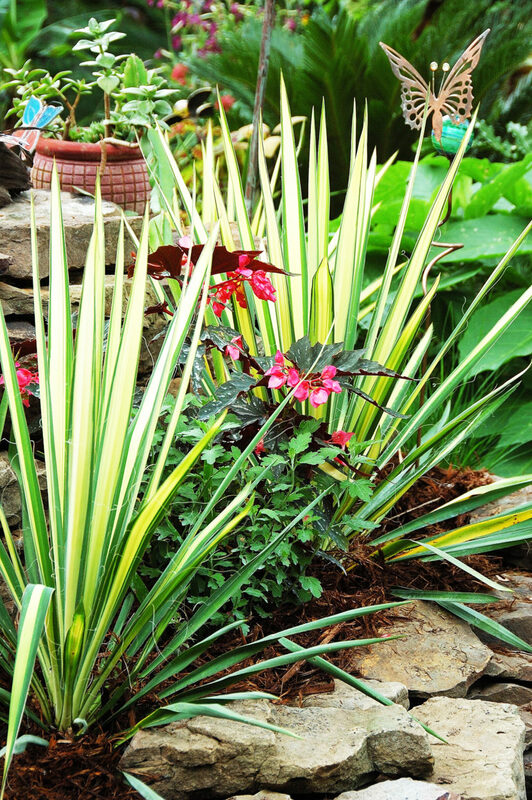 Color Guard yucca is normally seen two to three feet in height but can reach 6 feet, and three feet wide which is perfect for creating garden excitement with green and gold variegated dagger-like foliage. As you might expect from a native it is an extremely drought-tolerant plant that requires good drainage. If your soil is clay or muck that holds water then by all means improve your soil and plant on raised beds. I have grown them planted on raised beds in combination with torch lilies (Kniphofia) and in very non-traditional companionships with tall angel’s trumpets. My sister and brother-in-law in North Richland Hills have them in an idyllic poolside planting with agave, pampas grass and bananas. You will find the Color Guard will work in almost every imaginable situation, even in the fall with blue pansies or violas. Just be bold and give them a try. Though I love the green and gold of Color Guard know that there are also great blue selections like Hofer that allow even more creativity in combinations and mixed planters. I may be raving about the foliage and architectural aspects in the garden but each spring to early summer, another amazing site takes place as creamy white, lightly fragrant blooms are borne on 6-foot-tall stalks. These blooms are found to be a most delectable source of nectar for hummingbirds. To read the full article, pick up a copy of the July/August issue of LiveIt.